A simple REHAdapt mount with a TableClamp with QuickShift-adjustment with 3D-offset. The REHAdapt Table Stand with SuperClamp Base is most commonly used in conjunction with one of the REHAdapt Monty 3D wheelchair Mounts. 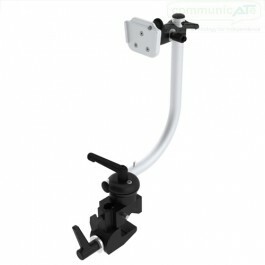 The Table Stand includes and uses the Manfrotto Superclamp to clamp on a table or square edge. TableClamp with QuickShift-adjustment and 3D-offset suitable for small and medium size devices. Easy to adjust due to handles, no tools required although device Adapter plates are purchased separately.